The advent of technology means more than just opportunities to connect with the people we need to reach the most, it also is a new field where marketers can fight over to gain a top spot amongst others, and doing it is not as simple as traditional marketing from before. There are more strategies and methods on how to come out on top, and one of them lies in three letters: SEO. 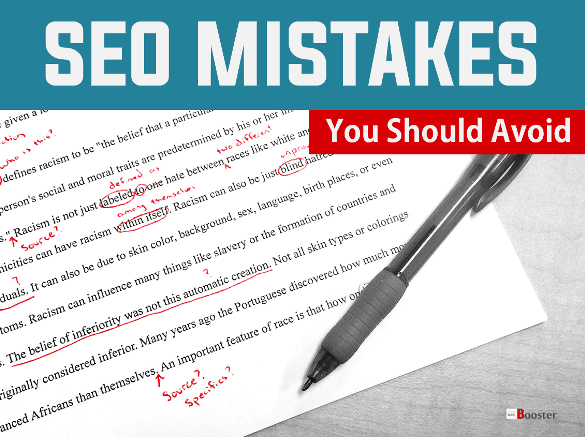 Today, we offer you a guide to the most common SEO mistakes that most of the bloggers make in their quest to optimize the search engine. Search Engine Optimization [SEO], is the “process of getting traffic from the ‘free, ‘organic,' ‘editorial’ or ‘natural’ search results on search engines”. The SEO basically means that websites and web pages are ranked by search engines such as Google and Yahoo, based on what their algorithms consider as the most relevant results for a particular search, not because of payment (which is under the paid search ads). The base reason why a website needs SEO is because of visibility. If your website is among the first that search engines show to your target audience, you generate more traffic and become more known in that specific field. Based on the algorithm that ranked your website, it may also mean that your website is considered an “expert” in the field that it moves in – which is an advantage for your website in terms of credibility. Below, we'll look more closely at ten potentially huge SEO mistakes and let you know how you can avoid them. Learn some of the most common SEO mistakes, and get suggestions for how they can be quickly avoided with a smart SEO optimization. This page will list the most but top 10 SEO mistakes you require to fix in order to get higher search rankings all the time. Avoiding these basic SEO mistakes will further improve your search rankings on Google/Yahoo/Bing engines. What most digital marketers would tell you is that SEO is something complicated – mainly because search engines have algorithms that change over time. Take, for example, Google. Their search algorithm changes 5-6 times in a year, and while most of them are minor updates, their major updates could affect search results in a lot of ways. This complexity can bring about some tactics that may ultimately fail, and if you do not realize this, your SEO strategy may continuously do so. Utilizing SEO can be complicated, tricky, and can change at any time based on what algorithm you primarily move in. It requires you to adapt and prove that your website can be recognized as an expert in the area you choose to focus on, and that’s just the small details of it. And most of the time, we can fall into the trap of committing any of the ten mistakes above. It is something, however, that you can avoid if you keep this infographic in mind. However, even if you’ve committed any of the mistakes as seen in the infographic, it’s not the end for your website. By knowing what you are doing wrong, you can take steps to change them and let SEO work in your favor. It will involve a lot of work to overhaul your website to conform to the algorithms, but once it all falls into place, you can enjoy the fruits of your hard work. Article By Jomer Gregorio - Founder and CEO of CJG Digital Marketing fastest growing start-up Internet Marketing Companies based in the Philippines. He is a well-rounded expert when it comes digital marketing. Jomer is also known as a semantic SEO evangelist and practitioner.